Martial arts have been a passion of mine for many years. I’ve spent nearly forty years studying various disciplines and have black belts in Shotokan Karate and Judo as well as my 6th dan black belt in Ju-Jitsu. It was in 1982 that I first began training with Grand Master Den Butler doing Shotokan Karate, earning my black belt four years later in 1986. Alongside this, I trained at Porthleven Judo club with Sensei Peter Safier where I achieved my black belt first dan. After a small break in training due to back problems, I got back in touch with Den Butler a few years ago. 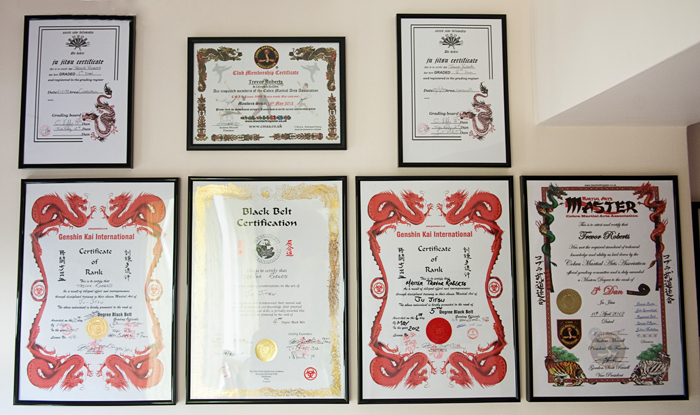 He is now a highly respected 9th dan and a Director of Cobra Martial Arts Association and it was at his Genshin Kai dojo in Melksham, Wiltshire, that I was awarded my 5th dan black belt in April 2012 and have since achieved my 6th dan. In the 1990’s I started my own Ju-Jitsu club which ran for 15 years, and in 2012 I re-opened my dojo doors. Now a thriving club with a great group of committed members, we are going from strength to strength. For more information click here. I continue to support blending disciplines and myself and my club work closely with the Tae Kwondo Cornwall Home of the Killer Bees. If you’re looking to do a martial art in the St Austell area, I highly recommend these guys. As well as practising martial arts and running the club, I’ve also always done seminars and demonstrations for various organisations, such as Young Farmers, Women’s Institute, RNAS Culdrose, colleges and other martial arts clubs such as Taekwando Cornwall. If your organisation would like a self defence seminar, please get in touch. trev, i know i’m biased as your my cousin, but i had a great time learning in your dojo. think it would be great for the villagers, or if you just want to get fit!!!!!!! Stumbled on this site when trawling through Facebook. I am so pleased to see you back into it and remember with much fondness the few years that Karen and myself were part of that great club. As I recall Jack was born the day after one of our training nights and this year he turns 21!! Take care and love to all from Terry, Karen & Jack-NZ!! Looking forward to training with you again Trev and also it’s good to see comments from Terry and Karen. Lets hope we can have as much fun as we used to…..can’t wait to get stuck in!! It’ll be good to get back on the mat! I’ll give you a call soon.